Ugli is a registered trademark for a tangelo, a citrus fruit, from Jamaica. The original tree discovered in Jamaica is believed to be a natural hybrid between a grapefruit, an orange and a tangerine. The variety that is imported out of Jamaica today has gone through some metamorphosis. I was reluctant for years to purchase it but this year I couldn't contain my curiosity, especially when I saw a crop that didn't seem to pass its prime. The price was per fruit so when the sign suggested to buy a heavier fruit I found it credible. The instruction made sense, when fruit is past its peak ripeness it gets pasty and mealy, inadvertently lighter. With the exception of bananas particularly in baking, I like to use fruit at its pinnacle. It will channel the best flavor results whether in jams or any other method of preparation. Preserving was a method to save an abundance of crops at their height of ripeness from spoiling and preserve them to enjoy during the leaner season months. While there is research showing that overripe fruit are richer in antioxidants, other research shows it can cause some gastric intestinal issues especially in certain segments of the population. That is a discussion for another time with a panel of scientists, nutritionists and doctors. You can see photos of the more familiar tangelo in my Coconut Panna Cotta and Minneola Tangelo Gelee post, which consequently was developed in anticipation of Passover 2010. 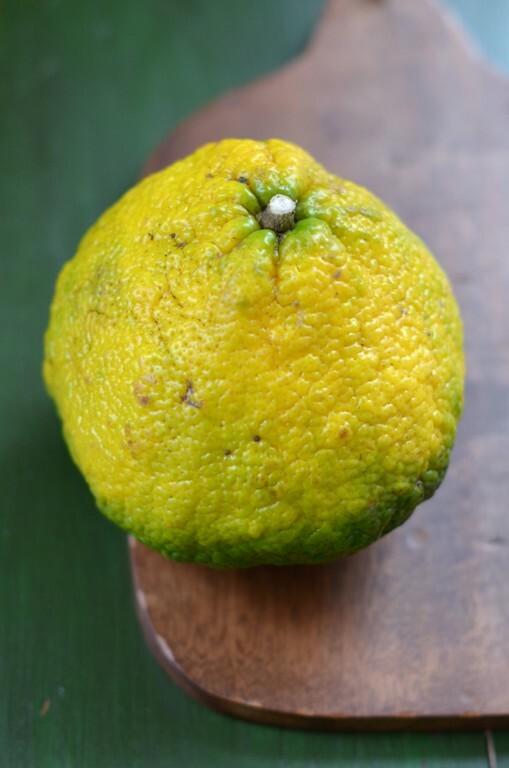 The Ugli fruit is a contradiction of sorts. A bumpy, rough, somewhat curious, but unappealing, tad intimidating exterior. 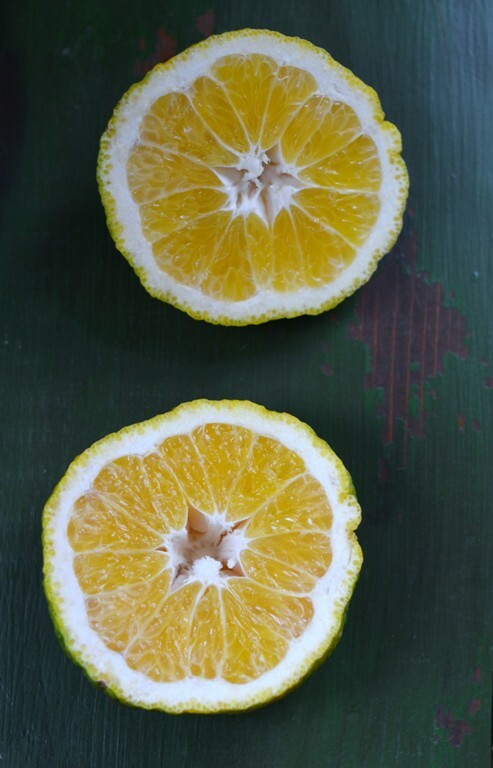 Only when halved, unveiled, to a stunning, glorious, unlike any other citrus I've ever seen. A warm, deep yellow with a tinge of orange yet still sunny and vibrant. Hefty with pulp bursting with juice, the first one I bought had somewhat of an aftertaste, reminiscent of citrusy/lemony sorbet sensation. I went in for a second and it was lacking that hint I found previously, this one more ripe, but still it wouldn't make my citrus of choice to snack on as is. What it did however was add to my arsenal, a brilliant in color citrus, to add to smoothies, lemonades and cocktails. A flavor profile that will marry well in jams and frozen desserts. 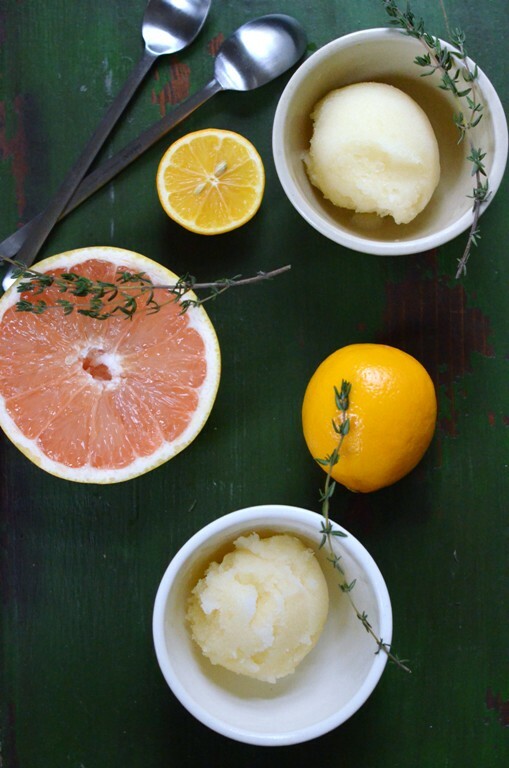 Initially I wished to showcase the Ugli fruit in all its glory, especially the vibrant unique color without compromise, but spring has sprung and I still had an abundance of citrus in my refrigerator which at the end of the day worked to my advantage and resulted in a brilliant sorbet. I really like the proportions in this recipe. The only exception that will still result in a similar sorbet would be using 1:1 Ugli fruit to ruby red. I also tend to use less sugar at 1/2 a cup to maintain some tang but if you have a sweeter tooth feel free to use 3/4 cup. 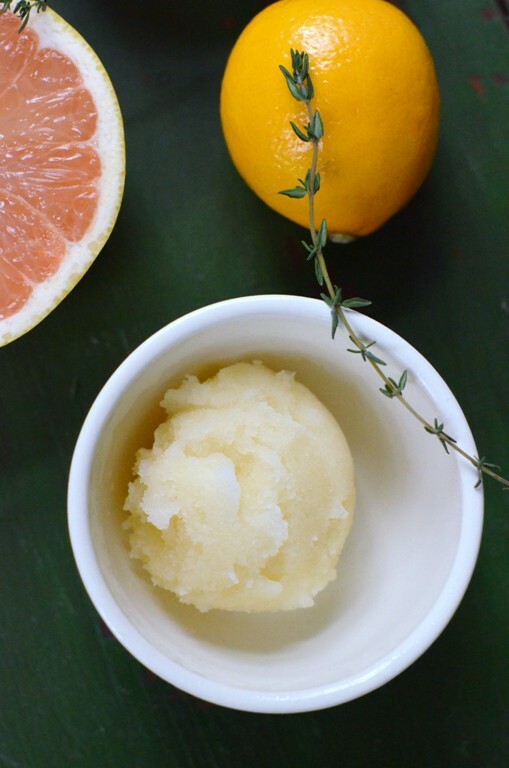 More sugar will result in a smoother sorbet. In the freezing process, the sweetness of the sugar is not as pronounced as in liquid form. Alcohol does not freeze which helps our sorbet reach a softer consistency. Many vodkas are made from rye or winter wheat which will make it unkosher for Passover, however there are some vodkas made from sugar cane and potato with a Kosher for Passover certification.You might wish to leave the vodka out altogether to make this sorbet kid friendly. My research came up with a couple of kosher for Passover vodka brands both from the US. The first Zachlawi Sweet Potato Vodka (scroll down) and the second Distiller 209's No. 209 Kosher-For-Passover (scroll down). The list of stores carrying these vodkas are listed on the sites. Dean and Deluca is also carrying the Distillery 209 kosher for Passover vodka. Thanks to my twitter in resident mixologist, bartender, Mark, @WalkerMarkLA. I go to him with all my spirits questions. He confirmed that vodka and grapefruit make a killer 'concoction' or as he put it 'grapefruit juice makes for a great cocktail mixer'. Add the juice, pulp and all, sugar and thyme to a medium sauce pan on medium heat. Let sugar dissolve without bringing to a boil and take off the heat. Let cool, cover with a lid* and keep refrigerated over night to let the thyme aroma and flavor infuse. Strain. Press with a rubber spatula to make sure all the juice strained through. Add a tablespoon of vodka if desired, mix and churn according to manufacturer's directions, about 20-30 minutes. Freeze before serving. After dissolving sugar and taking the juice off the heat, I let it cool, transfer it to a plastic or a glass container with a lid, and keep it refrigerated overnight for the thyme to infuse. If I don't add alcohol to the sorbet I would let it thaw for few minutes on the counter before scooping. I use an ice cream scooper dipped in water before each scoop. Ahha, I do know what an ugli fruit is even I have never eaten one, I am Crossword Puzzle nut. I just made a lime sorbet but didn't know that vokda will kep it softer because that stuff was hard as a rock. Lovely sorbet, so refreshing. Ooh crossword puzzle nut!! I find them very difficult. I am a scrabble one! :) Yep right ratio of sugar content helps as well as other factors like ice cream machine and freezer temp. 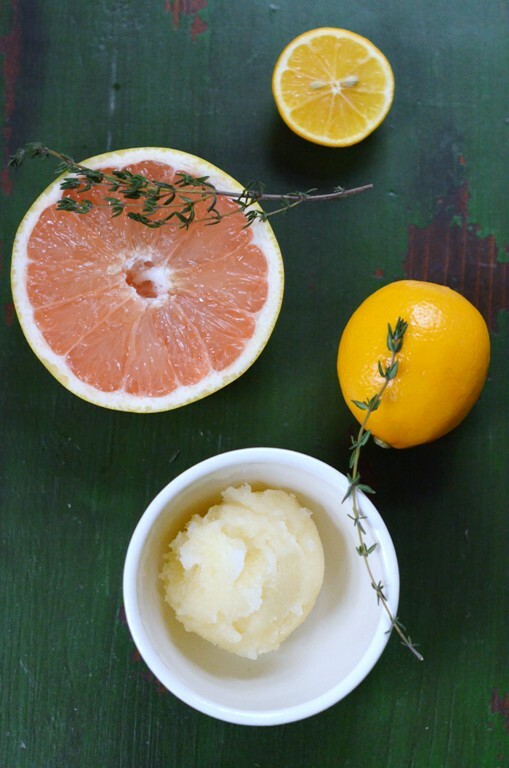 I love the combination of different citrus in this sorbet. Beautiful photos as well, Shulie. I know isn't it incredible?! I think still it is pretty much exclusively exported from Jamaica. How refreshing is this sorbet! 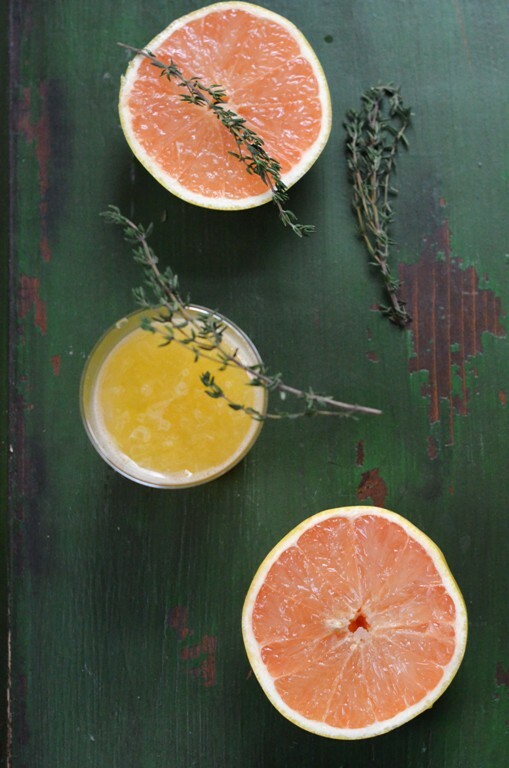 Love the fusion of thyme and grapefruit and lemon. YUM! This is such a beautiful fruit. Love the different citrus fruit combination here. I'm picturing a tangy sweetness that puckers your lips ever so slightly, yet the refreshing iciness of the sorbet numbs that sensation. This is quite the seductive citrus treat. I got nothing to say other than can you write in this space?! You are so poetic. Beautiful comment! Wow - the deliciousness of the sorbet, the beauty of the pics, and the poetry of a certain rabbit's comment. Talk about a trifecta! A delightful sorbet! Citrusy desserts are just fabulous. Definitely. I am having so much fun with mine! Happy Passover! 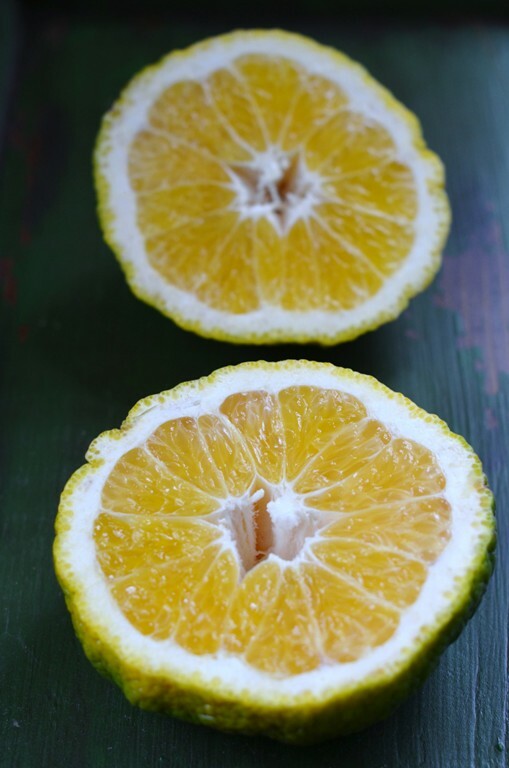 We've been getting such good citrus this season - this looks fantastic! I know, right?! Citrus this year has been top notch. UGLI is a beautiful fruit! I've never come across it, and thank you for the wonderful informatio, Shulie! I love citrus fruits with a lot of character! Of course. Let me know how it turns out! J & I are saddened we practically inhaled it and now left with none. Will probably make another batch next week when we are back from a quick trip. oh my! I love everything about this!